Much of my work revolves around managing complex projects and programs, which requires checking in on a regular schedule, looking months ahead, or planning backwards from a deadline. A typical monthly calendar doesn’t work very well–I need to see the entire year on one page so I can envision it all at one time, preferably as a single stream so I can more accurately see the distance between days (having been tripped up by months with five Mondays, for example). 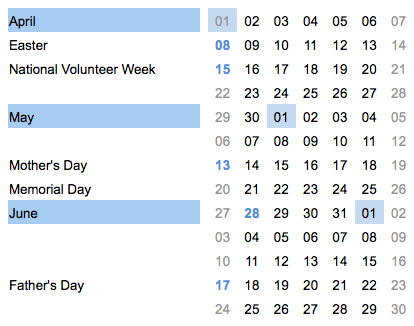 I also need to know about major holidays and events so I don’t make the inadvertent mistake of scheduling a meeting on Memorial Day or Yom Kippur, dates that move around from year to year. I’ve found a great solution from David Seah, an “investigative designer” who has this insatiable desire for organization and time management. I’ve taken his Compact Calendar and modified the holidays to reflect the ones that affect me most. I’ve used it for years now, printing out a copy before I head into a big project meeting and marking it up as we work out a schedule. It is a different type of calendar so it’s takes a little adjustment, but I’ve found it so helpful for planning, I’d be lost without it. Of course, if I find something useful, I love sharing it with others (that’s why I have this blog), so to help you with the next year, here’s the 2012 Compact Calendar for Engaging Places as a pdf. This entry was posted in Resources and tagged Compact Calendar on December 15, 2011 by Max van Balgooy. Max, you must be an early bird like me! Thanks, Max, this is a cool tool. Really appreciate your blog too, it’s filled with useful, valuable and fascinating info.